Animal Defenders International : Animal rescues : SAVED! Lonely zoo bear gets her storybook ending! Dominga and her sister were illegally torn from the wild as cubs; officials confiscated them from wildlife traffickers but with nowhere for the bears, they were placed in a small Andes mountain zoo, Mirador Taraccasa in Abancay. Sadly, 14-year-old Dominga’s sister died about four years ago and since then she has been alone, with the zoo having no options for her. 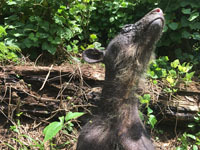 Since her sister’s death, stress has led to Dominga suffering weight loss and severe alopecia,so where she should have thick, black fur she has none, except for a striking Mowhawk line of hair, running over her head and down her back. 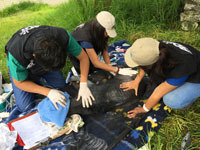 With the support of Peruvian wildlife department SERFOR and the zoo (now committed to becoming a sanctuary for smaller wildlife), the ADI rescue team began work at the zoo at 5am. ADI veterinarians sedated Dominga and set to work trimming her overgrown claws, massaging cream into her dry, infected skin, and running a battery of tests. She was then placed in a custom-made travel crate for what would be a long and complicated journey. However after getting off to a flying start, after just a couple of hours, Dominga’s truck broke down on a remote mountain. The team had to wait three hours for a new truck, feeding grapes to an unconcerned Dominga in her deep nest of hay and blankets. Once back on the road, Dominga and the team continued for two days and made the final leg of the journey along the Madre de Dios River to Taricaya Ecological Reserve, with Dominga’s travel crate perched on the front of a wooden boat. Dominga arrived at her new forest home at Taricaya on Valentines Day, her travel crate was opened, she looked around and then raced into the lush greenery in the ADI enclosure. The enclosure has natural vegetation, a cave, a pool, and various platforms and climbing areas. Dominga was incredibly inquisitive, exploring and even uprooting plants to taste them. Next door to Dominga is another bald female spectacled bear, Cholita. A special meet and greet corridor links the two enclosures so that the bears can have safe contact and perhaps in the future, share their habitats. 18 months ago, ADI responded to an urgent call to rescue 27-year old Cholita, who had been severely mutilated by a circus, her fingers had been cut off (to remove her claws) and her teeth snapped off. ADI formed a partnership with Taricaya Ecological Reserve and their partners Projects Abroad, to provide a sanctuary home for Cholita. Then, within weeks of Cholita’s arrival, ADI was asked to help rescue two more bears from an illegal zoo, Lucho and Sabina. ADI and Taricaya, together with wildlife officials and police, rescued Lucho and Sabina in a dawn raid. This has established Peru’s first government-recognised rescue centre for bears. 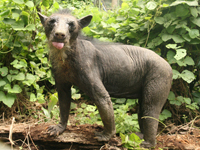 The Andean/Spectacled bear (Tremarctos ornatus) is South America’s only species of bear and they are endangered. On the most-critical Appendix I listing under the Convention on International Trade in Endangered Species (CITES), all international trade in Andean/Spectacled bears is prohibited. However, they suffer severe threat from illegal traffickers and hunters. Following the recent killing and mutilation of a spectacled bear in Colombia, along with a threat issued to kill more bears, ADI has launched the South American Bear Pact, calling for a coordinated effort to save the Andean bear from extinction.